Last night we sat around an open fire, wood smoke gently infusing the air, experienced the joy of live music, drank wine, ate heartwarming food and laughed with friends. Under canvas. 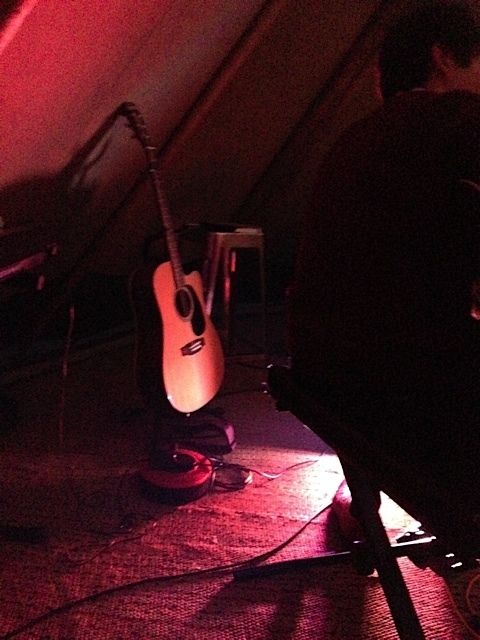 In a teepee. Slap bang in the centre of Leeds. It sounds bizarre but its true. 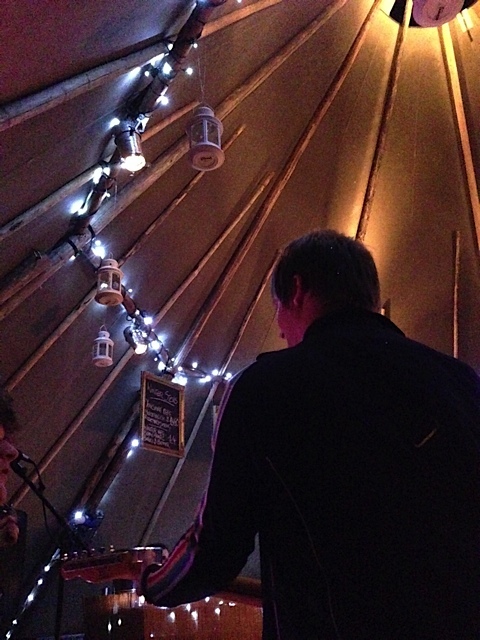 Legendary Leeds venue The Faversham has long been part and parcel of the student furniture but this year they have a 100 seater teepee in their back garden (no, really). We got an invite to the opening of their ‘Festive TeePee Social Club’ on a cold November night and we were suitably intrigued. 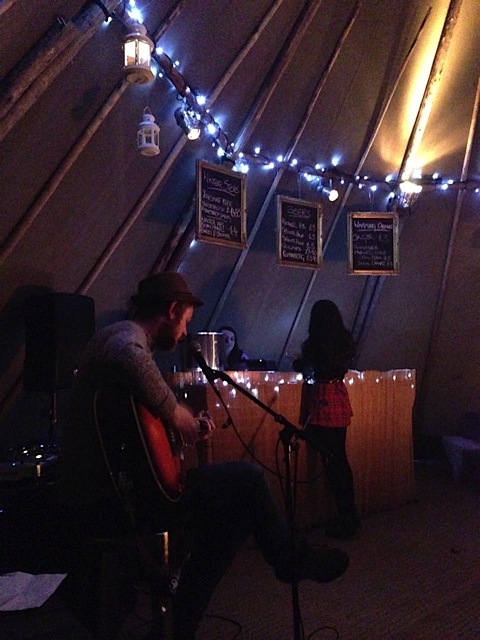 Running from now up to Christmas, the enormous tent is home to a chilled out vibe, open fire, bar serving seasonal beverages of the craft beer and mulled wine variety and comfy sofa bed things and picnic tables – it sounds random but it works. So we settled down for a night to remember. It so happens that every Thursday is open mic Buskers night where local artists who ply their trade on the streets can come along and have their shot at the big wigwam (sorry). If I’m honest we only intended to stay for an hour or so, but we were drawn in by the steady procession of artists, some good, some brilliant. The fire glowed and the tent filled, people occupying every nook and cranny of the tent sitting on cushions, intoxicated by the joy of the flame, the music and an ancient under canvas feeling when its cold outside – if you’ve camped you’ll know what I mean. Piping hot beef stew with horseradish dumplings were served and greedily devoured, soaking up the very reasonably priced house red wine,£11 per bottle, Rose £9: bargain. 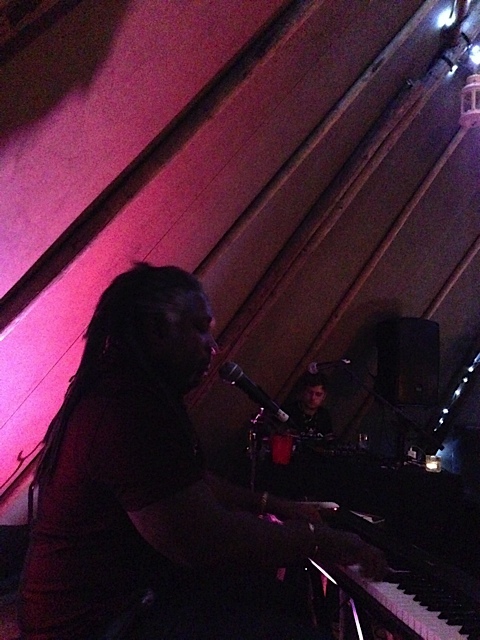 Our plan to leave was shelved and the evening went from good to great with fantastic performances by compere Cleve Freckleton AKA Rev Chunky and the talented singer songwriter Amy Sowerby. This was an unexpectedly brilliant evening and the surroundings made it all the more special, dare I say magical. I’d say we were comfortably the oldest there by a long chalk (although Rev Chunky gave us a run for our money, uncomfortably/accurately dedicating ‘Stuck in the middle with you’ to us) but to be fair, the young crowd weren’t too annoying and studenty and we didn’t feel out of place. In fact we were right at home. 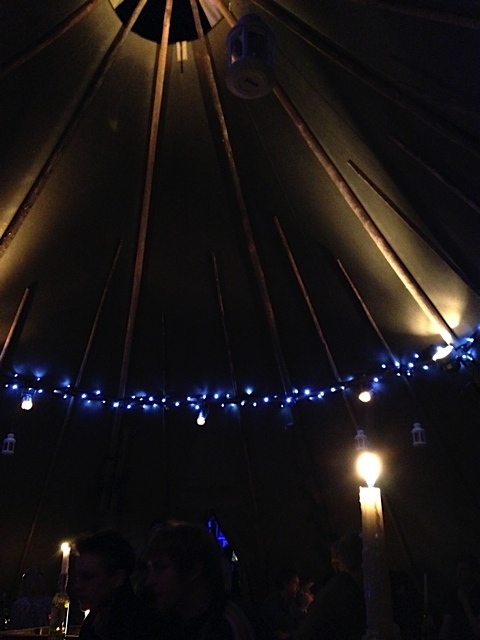 I would conclude that it’s well worth a trip out to The Faversham before the end of December, which is a good 15 minutes walk from the centre of Leeds or a very short cab ride, even if it’s to sit by the fire sipping something warming in the majestic teepee. My top tip would be get there early next Thursday for the Buskers night and if you see us in the corner, come and say hello, we’re easy to spot: stuck in the middle.